Established in 40 - s easy MI-1, despite all its merits, by the end of the next decade, has already ceased conform to the level of the world's best pilot. Abroad, and especially in France, a number of new light rotary machines, far beyond Soviet analogue of flight performance. This was achieved mainly through the use of the power plant as a new turboprop engines. In EDO Mil understand the need to improve the performance of its first - and 50 in the second half - ies developed several projects modernization My deep-1, including the replacement of piston engine turbine. The idea of upgrading the existing models instead of developing an entirely new model at the time seemed promising, as well as save time and money and allow use brought developed in the production of parts and assemblies. During the project work odnodvigatelnogo turbine My successor-1, named V-5, the designers OKB formed opinion on the feasibility of establishing a helicopter with a power plant of two GTD, which would significantly greater reliability and safety of flight. 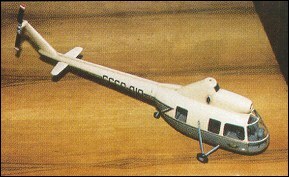 Draft dvuhdvigatelnogo helicopter was called V-2. Source: VR Mikheyev "MVZ them. Mil - 50 years"